Coupon not valid with any other offer. Must present coupon at time of purchase. Limit one coupon per person. Coupon does not apply to prior purchases. Other restrictions may apply. Void where prohibited. Offer expires 4/30/2019. 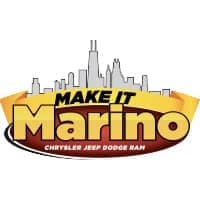 Valid only at Marino Chrysler Jeep Dodge. Coupon must be presented at time of service check-in. Cannot be combined with any other coupons or in-store offers. No cash value. See dealer for details. Expires 4/30/2019.